Whenever I want to spend real quality time with my children, we bake together. There are so many teachable moments in baking and such great conversation, followed by lovely anticipation for that sweet treat at the end. Baking is especially fun and relaxing when you are well-organized and have everything prepared…sort of like Martha Stewart. The reality is that we are often not prepared enough to have a stress free creative activity with our kids. That is why Mamapicks is really excited about Crafty Cooking Kits that are new to the Canadian market. They include EVERYTHING you need to bake with your kids. All you add is eggs,water and oil. Last week, Saturday morning was chilly and wake-up time was the usual inhumane 6am. By 10am, we were going a little nuts with The Boy (4.5) and The Girl (3). We needed something great to do with the kids and decided to try out the Paint Your Own Animals Cookie Kit. The kit included everything from the cookie mix to the icing mix and brushes for the kids to paint with. Instructions were simple and the baking experience was so contained and stress-free. My kids measured, talked, painted, cooperated, tasted… We all had so much fun and then enjoyed the cookie creations together. It made me think that the baking kits are also great for playdates and get-togethers where you need an activity to keep the kids busy. A real must-have for your pantry. The deluxe kits have up to 12 pieces, perfect for a birthday party. Nut-free and kosher kits are available too. Me, Myself and Us is the Canadian distributor of the kits. You can check out the product line on their website. They are giving away two Crafty Baking Kits to three lucky Mamapicks readers! To win, become a fan on their Facebook page. Here, you will find information about retail stores that carry the kits. Write to Mamapicks to let me know which location is closest to where you live. 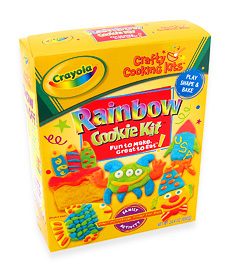 The first three people to write in will receive a package containing two amazing Crafty Baking Kits! (Please note packages must be picked up). Good Luck! Posted in Activities & Events, Contests & Giveaways, Cool Products.